If you are at all familiar with Russian fairy tales, you are familiar with Baba Yaga. Her appearance is nightmarish: a long crooked nose that touches the ceiling when she sleeps on the pechka, iron teeth perfect for biting through human flesh, and a “boney leg” supposedly gleaned from a human boy. Her preferred method of travel is a mortar and pestle instead of a broom. However, she does use a broom to sweep away any traces of her passing as she races through the enchanted forest. She lives in a hut on chicken legs—a rather stubborn and rambunctious creature with a mind of its own. In one story, young Vassilisa finds the hut surrounded by a fence made of human bone, human skulls sitting on the fence posts with eyes glowing like lanterns. In most other tales, the hero must beg the hut to “turn towards him with its front, and to the forest with its back”. The hut always takes it upon itself to let the visitors in. Illustration by Amy Wang, Graphic Fiction Editor, The Spectatorial. As a little girl, Baba Yaga was meant to scare me and warn me away from bad behaviour. Bad little girls got cooked in her pechka, it was implied, but good, industrious, clever little girls escaped her clutches unscathed. Yet, no matter how pure-hearted Russian culture demanded me to be, I could not dislike Baba Yaga. I could not be afraid of her. Even at a young age, she was fascinating to me. It was hard to ignore the pull of the wicked. Morality aside, I am sure various folklorists and scholars would agree with me. Studies in Russian folklore thrive on Baba Yaga’s ambiguity. Famous folklorist Vladimir Propp identified Baba Yaga as fitting into three tropes at once: donor, mother, and villain. In Baba Yaga and Vassilisa the Beautiful, the old witch gives Vassilisa an impossible amount of chores to test her cleverness and virtue. Vassilisa accomplishes the tasks with the help of a talking doll and her dead mother’s blessing, and impresses Baba Yaga by asking the “right” questions. Baba Yaga acts as a surrogate mother to Vassilisa, harbouring her from harm when the girl’s own surly stepmother sends her out of the house into the dark, monster-ridden forest to find light for sewing. Talk about a suicide mission. In the story Gussi-Lebedi, Mashenka neglects to watch her little brother, as she is told to do by her parents, and he is taken away by Baba Yaga’s evil geese. Mashenka flees into the forest after the geese. She is able to rescue her brother by learning compassion: helping the apple tree shake off her apples, removing the baked goodies from a tired talking oven, and moving a large rock to help a stream flow. On her return journey the stream hides her under her water, the oven blasts the geese with soot, and the apple tree covers her with her branches. It is only by learning kindness in the face of Baba Yaga’s wickedness that Mashenka is able to rescue her brother from being eaten. In stories like Ivan Tsarevich Baba Yaga appears as an instrumental donor character in the hero cycle. The hero stumbles upon her hut during his quest, and if he has a pure heart she gives him a magic object necessary to complete his journey. Ivan Tsarevich approaches the hut “half of his own will, and twice by compulsion”, and asks Baba Yaga if she knows the location of the tenth kingdom. Here Baba Yaga’s character triples. She sends him to see her two sisters, each appearing the same as the first, each living in exactly the same hut. The first two turn him away while the third offers him three iron horns, and threatens to eat him if he does not use the right one. Ivan escapes by blowing into the last horn the loudest which brings the golden firebird to his rescue. Coincidentally, the bird takes him to the tenth kingdom (and to the beautiful princess) he was searching for. Part of the paradox is the fact that it is the second sister who tells Ivan how to defeat the third. This particular story shows the true complexity of Baba Yaga—she is both an instigator of the story’s forward-motion and an obstacle to overcome. Vassilisa’s encounter with Baba Yaga ended favourably as well. After doing the sweeping in the chicken-legged hut and cooking supper for Baba Yaga, Vassilisa is released from the hut with one of the human skulls—the light she came to find. The light leads her through the dangerous forest home. Safely away from the wilderness she confesses to her father about the stepmother’s wickedness, which inspires him to abandon the woman and her daughters in favour of his one beloved biological daughter. Then, quickly, so as not to lose her good luck, Vassilisa the merchant’s daughter marries a prince who recognizes her beauty and intelligence. Lucky woman! The Baba Yaga in Vassilisa’s story is not the true villain. True wickedness is revealed in the humans who wish each other harm. The stepmothers who send young girls into the forest to die get their unfortunate but deserved ends, whereas Baba Yaga emerges as the wise old woman. Baba Yaga initiates Vassilisa into womanhood by challenging her. Another theory I stumbled upon through the work of Andreas Johns characterizes Baba Yaga as a guardian of the realm of the dead. Her hut is an essential pit-stop in a hero’s travels through the forest. As soon as the hero is far away from civilization (the realm of the living), they encounter the hut. They never pass further into the forest (the realm of the dead). Once they outwit Baba Yaga, they return to the realm of the living, either to continue their journey or to live a content life. Baba Yaga releases them, Johns argues, because they are not yet ready to join the dead. There are further clues to Baba Yaga’s role in storytelling. She threatens to eat humans but there is never evidence of her actually eating them. The human bone fence would mean nothing if she were guarding the entrance to the realm of the dead. If anything, it is a warning to the living that they are trespassing. There is no reference to human flesh in the supper Vassilisa cooks her. In fact, two of the challenges involve cleaning the rocks out of a pile of grain and the dirt from a sack of poppy seeds. On several occasions, Baba Yaga is repulsed when she smells humans in her hut. “Fu, fu, fu,” she says. “I smell the stench of the Russian spirit.” For all intents and purposes, Baba Yaga prefers sweet poppy seed rolls over plump children. I prefer to think of Baba Yaga as a wild creature. Her domain is the forest. Her acute sense of smell and her allusions to eating human flesh give her away as a beast rather than a human. Her prerogative is time. She is guided by three horsemen: one white, symbolizing dawn; one red, symbolizing noon-day; and the last black, symbolizing midnight. She ensures that the hero moves forward in time, for it is only in the forest behind her, in the realm of the dead, that time stands still. Her role is an ancient one. By opposing the hero, she guides them towards righteousness and goodness. She does not appear good or righteous herself, but draws those traits out of heroes who need those characteristics to leave her hut, move on, find happiness or wealth, marry—essentially, to grow up. 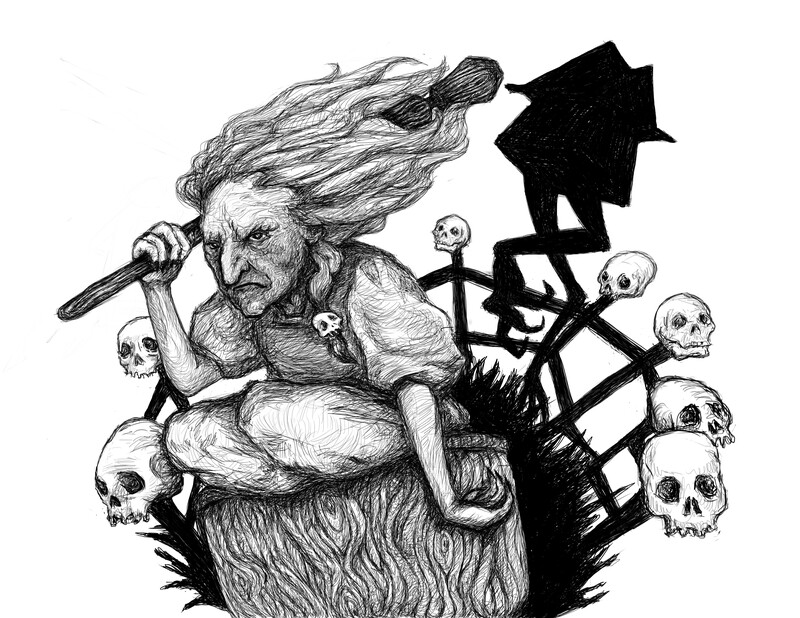 At first, I was attracted to the character of Baba Yaga because of her wickedness. Darkness is seductive, even in the form of a hag. Now, I understand that it is the ambiguity, the multiplicity of her character that I loved. We like our characters to be a little wicked, but not too wicked. We drool over the manic aggressive werewolf and the bloodthirsty vampire so long as they have a “sensitive side”. Then we condemn them when they kill senselessly, acting as the beasts that they are really meant to be. The tension between beast and human adds complexity (and much teen angst) to an addictive, bestselling story. I suppose the same desire for narrative tension gives Baba Yaga a rather ambiguous reputation. She is not a character to be easily revered or condemned. Like time, nature, and death she simply is. Lately, having almost completed my degree and taking the next step in a romantic relationship, I find myself thinking of the stories I was told as a child. Would I be clever enough, would I be pure-hearted enough to leave Baba Yaga’s hut? Sometimes I toy with the idea of not leaving at all, enchanted by timelessness, suspicious of the world beyond the forest.